Here are some of the stocks that I am watching for tomorrow (7/14/17). Thank you very much to this millionaire trader for bringing these to my attention via his free email list updates. 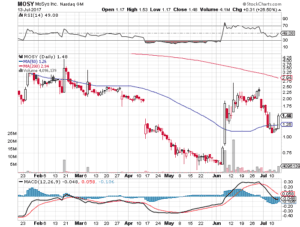 MOSY had a great day today moving up to the $1.48 region on decent volume. 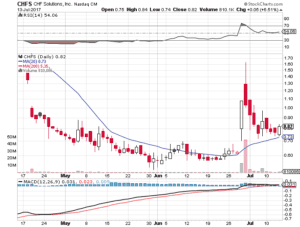 If it consolidates here we could see a move up next week to the previous highs above $2 per share. $CHFS has formed this gorgeous consolidation in its bull flag pattern. I will be taking a position in this tomorrow or early next week if it holds these levels. 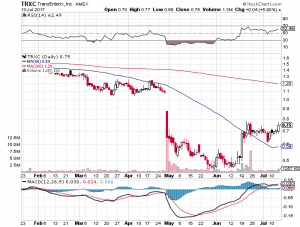 My stop loss would be close to the bottom of the candles around the $0.73 level, close to the bounce off the 20 MA. Target price would be $1.4+. This is another nice chart! Why? We are right at the breakout of a relatively tight base – a break over about $0.8 on decent volume could send this towards the gap fill above $1 per share. The nice thing is this trade has a nice asymmetric risk reward – if it falls below the $0.7 base the pattern is failing – stop loss should be around there IMO. If you buy at these levels you are only risking $0.05 and stand to gain $0.2 – $0.5 if it works. These three charts are my top stocks to buy this week or early next week! I am a member of several top stock picking services (you can read some of the reviews of these services HERE). 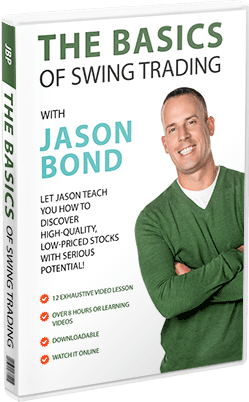 I like to share to share what I find with other traders and although I am a little limited on research time, I rely on weekly free email updates from Jason Bond Picks to help. Hope this helps! Happy Trading. Please share these charts on social media so others can benefit from them as well.